One can praise the Israeli habit of Yom Kippur bicycle riding, or one can denounce it. However, one thing one cannot do is ignore it. The streets of Israel have been flooded with bike riders on Yom Kippur for quite a few years, and it has become clear that bike riding on Yom Kippur has gone mainstream. Who are the Yom Kippur bicyclists? JPPI’s Israeli Judaism Project has discovered that Jews defining themselves as “Haredi” or “Traditional” do not bike on Yom Kippur, nor do their children. The biking population is composed mostly of Israeli Jews who identify as “Traditional” or “Secular”, especially their children. Bike riding on Yom Kippur is first and foremost a children`s phenomenon. Only 7% of all Jewish Israeli adults say they bike on Yom Kippur (according to a survey conducted by the Municipilty of Jerusalem – 40% of Israeli adults ride bikes, and among them 48% ride every week). In contrast, 34% of adults say their children ride bikes. If you account for how many of these adults have children old enough to ride bicycles, one can calculate that 43%, almost half of Israeli children, ride bikes on Yom Kippur. Another interesting finding from the survey shows an inverse correlation between keeping tradition and riding bikes. The more traditional you are – the less chance you`ll be riding your bike on Yom Kippur. While this in itself is no surprise, what is surprising is the fact that the percentage of adults who bike on Yom Kippur is significantly lower than the percentage of children who do so. Therefore, the fact that adults refrain from riding bikes on Yom Kippur because of their adherence to tradition does not necessarily carry over to their children. A close look at the data shows that among those who identify as “completely Secular” about twice as many children bike on Yom Kippur than do adults. Among the “Traditional” and the “Seculars who are somewhat Traditional,” about five times as many children bike than adults. These numbers show that the percentage of adults biking on Yom Kippur correlates to the level of adherence to tradition, and that there is a major gap between those who identify as completely secular and those who identify as somewhat traditional. That gap, however, decreases when it comes to children. The percentage of biking is pretty much the same among children from “completely Secular” families and those from “Secular, who are a bit traditional” families. The percentage of children from “Traditional” families who ride bikes on Yom Kippur is lower, but still considerable. Furthermore, virtually no religious adults ride bicycles on Yom Kippur, but there are religious kids who do so: 25% of adults who identify as “Liberal Religious,” 10% of those who identify as “Religious” and 7% of those who identify as “National Haredi” claim their children bike on Yom Kippur. The biking phenomenon can be a sign of one of two changes in Israeli society: either that the very fact of children biking on Yom Kippur has caused Israeli society to accept this practice (although it is not true among adults, who still see biking as breaking tradition), or that we can expect that in Israel`s next generation, biking will become an important Yom Kippur tradition; we can also expect the percentage of adults who bike to rise accordingly. 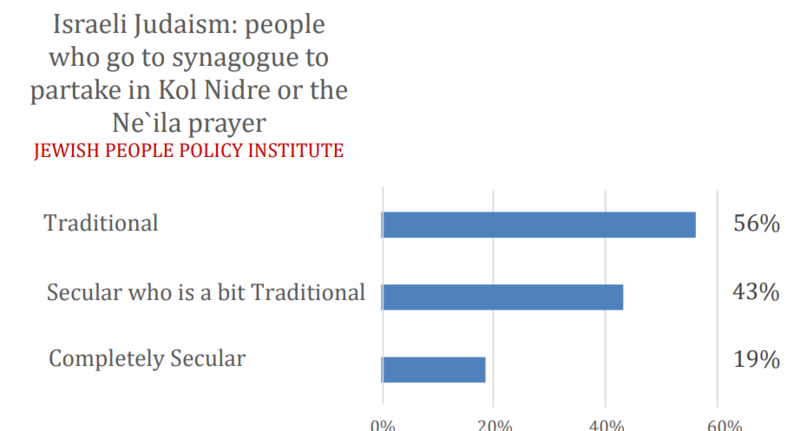 The gap between those who identify as “Completely Secular” and the two traditional groups (who together compose about 40% of Israel`s Jewish population) is also apparent in other Yom Kippur habits, Like the percentage of those who recite Kol Nidre or the Ne`ila prayer in a synagogue. JPPI’s Israeli Judaism Project is headed by Senior Fellow Shmuel Rosner and Professor Camil Fuchs (Tel Aviv University), who oversees the surveys and statistical analysis. JPPI Fellow Noah Slepkov assisted in data analysis, drawn from a survey conducted of 3000 Israeli Jews in two rounds, one of 2000 Israeli Jews and another of an additional 1000 respondents, a representative sample of the Jewish public in Israel. The statistical margin of error for the sample of 3000 survey respondents is 1.8%. The Jewish People Policy Institute (established by the Jewish Agency for Israel) is a think tank located in Jerusalem. Through strategic thinking and long-term action-oriented policy planning, JPPI focuses its efforts on ensuring the thriving of the Jewish people and the Jewish civilization. Avinoam Bar Yosef is President of JPPI, and Ambassadors Stuart Eizenstat and Dennis Ross are the Institute’s Co-Chairs. For additional details contact Adar Schieber at JPPI: 02-563-3356, adar@jppi.org.il; info@jppi.org.il. Data including children and adults and collected only from families that include children.